Today, I've got a post over on the 3GirlJAM blog. 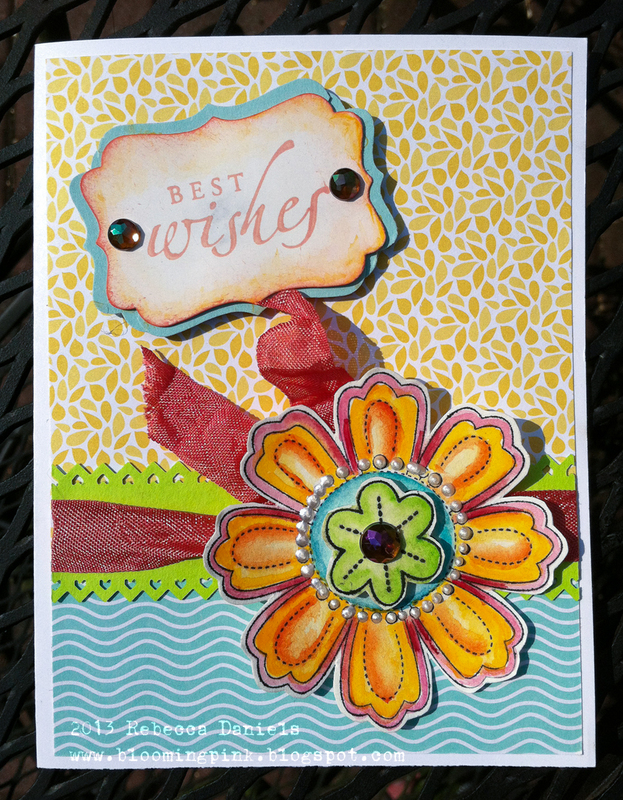 It's featuring the card above, which is one of several graduation cards I created over the Memorial Day holiday weekend. As I mentioned over there, we attended several parties celebrating high school and college graduations for several members on my husband's side of the family...and we're not done YET...we have another party next month! One excellent benefit was that over the weekend with all the graduation fun, I didn't have to cook at all until Memorial Day! It was great. - The wavy blue designer paper, I received from Paula's Kit club (several years ago) when she sent out a birthday kit (the other side has some really cool cakes). I've been hoarding this paper for just an occasion like this. - The stamps are also Stampin' Up (and retired). Sincere Salutations and Playful Petals. - I punched two additional labels in Baja Breeze (retiring), and then cut them to fit under the sentiment. - I punched a scrap of very bright green card stock (BRIGHTS) and used the retired punch to create the pinking heart edges. I wished they hadn't retired that punch. It's one of my favorites...but I think they were having issue after issue with the manufacturing of it....I was just lucky to have received one of them that worked perfectly! - The rhinestones are in two different sizes. I've hoarded these and use sparingly on only special cards because of how wonderful these rhinestones look in the light. They are faceted with many wonderful colors! Another product don't know the name of! - I stamped the large flower (Stazon waterproof ink) and water colored (Schmincke watercolors) the flower on a piece of scrap watercolor paper (90 lb Canson Cold Pressed). I stamped the center flower from the stamp on a small piece of watercolor paper and cut it out to fit atop the base flower. I think this part took the longest, because I was quite meticulous on the coloring. I know a lot of folks that can whip beautiful watercolor cards in a snap. I guess I'm not one of them! So there you have it. I was so happy to give this card to one lucky graduate (Dave's niece). I hope she liked it as much as I did. Let me know if you have been lucky enough to have a special someone near you finish college or high school! It's so wonderful to celebrate their accomplishment with them, isn't it? I certainly remember how HAPPY I was when I finished my degree! I saw your card over at 3GJ and had to scoot over to tell you here how pretty it is! I also had a motive...wanted to know what the pearly pearls around the flower is. Thanks for sharing...you are such a talented lady!